This was to be Muffin's last 4000-footer, and I wanted to be sure to pick the best day for its success. I was scheduled for surgery the following week which would keep me from taking any White Mountain hikes for over a month, and I also wanted to get her application in by March so she could participate in April's awards. In other words, we had to succeed, or wait a year. Of course, Mt Waumbek is not one of those peaks that often cause you to turn back, but it was winter in New England so anything was possible. At any rate, I picked February 1 as the best day of the week weatherwise, both for the hike itself and for our chances of having a safe drive up from and back to Massachusetts. It had snowed a little the night before, and when we got to the trailhead, I found that I couldn't get up Starr King Road to the parking area as it was icy underneath the new snow. The parking lot across Route 2 was also pretty snowy and downhill from the road, and I didn't think I'd be able to drive back out of there again. Luckily, the people at the Old Corner Store just down the street pointed out an adjacent public parking area with room for several cars. 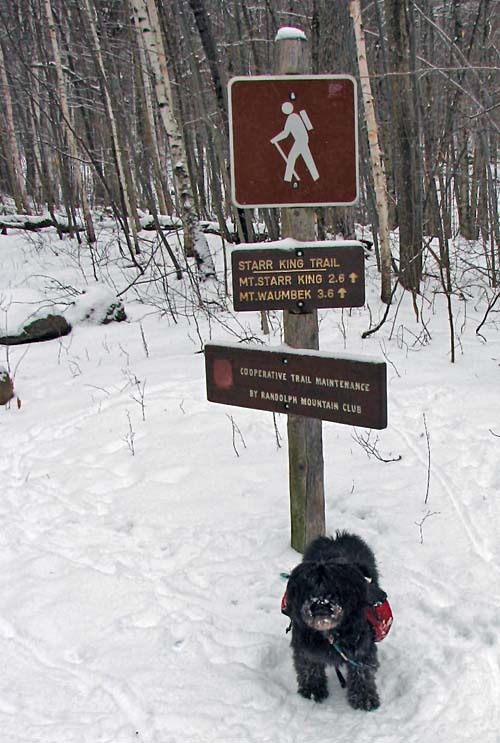 After walking a few tenths of a mile up the road to the start of the trail, Muffin and I were officially underway. 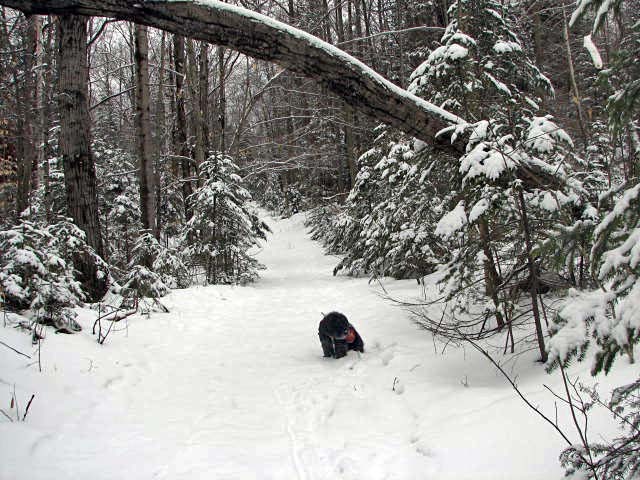 There was about an inch of new snow at the trailhead with decent hardpack underneath, so travel was easy. I put on my snowshoes anyway, at least for traction in icy spots. 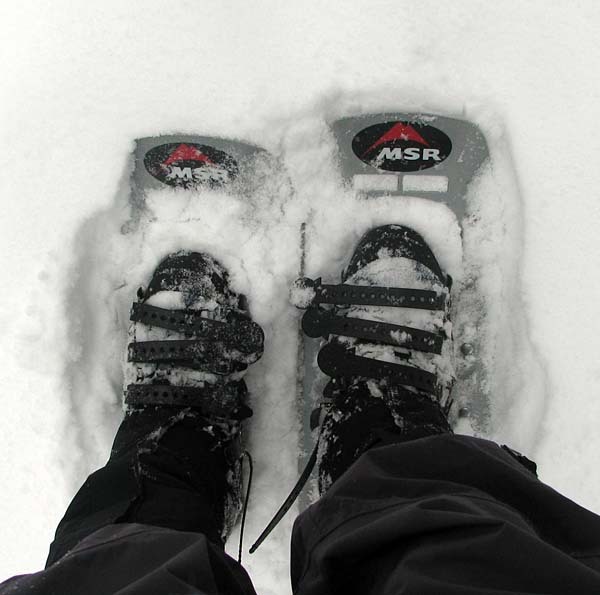 My snowshoes are MSR Denali Ascents. They provide pretty good traction on steep icy ascents, although they're not quite as steady when going downhill. I also have extension tails that I can add on for more flotation in deeper powder, but I don't often use them. About a quarter mile up the trail, there's an old stone well that may have served a farm or a pasture at one time. It seemed to be blocked off a couple of feet down, and didn't seem dangerous if anyone accidentally fell in. Muffin at the Starr King Trailhead. On Starr King Road, there was a layer of ice underneath the new snow, and I couldn't drive up to the trailhead itself. I parked in a small public lot next to the Old Corner Store on Rt 2 and we walked up. 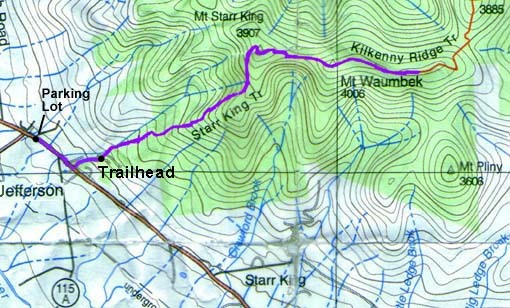 The Starr King Trail near the beginning of the trail. There was about an inch of new snow down low, and maybe 3 of 4 inches up high. A closeup of Muffin on the trail. We were barely on our way and already she had managed to cover herself with snow. My snowshoes. I have MSR Denali Ascents. They provide pretty good traction, and you can add on extension tails for more flotation in deeper powder. An old stone well. 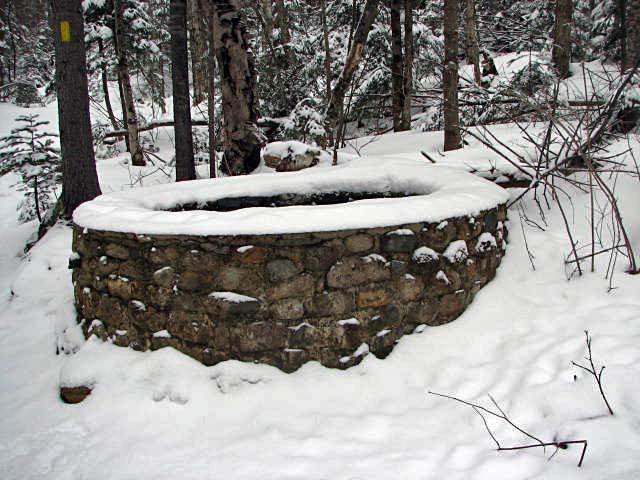 Located about a quarter-mile up the trail, this well must have served a farm or pasture at one time.